We’d love your help. Let us know what’s wrong with this preview of I Take Thee, Serenity by Daisy Newman. This is the story of Peter and Serenity, two young people confronted with the problem of making a true marriage in the midst of today's confusions. On one side is the modern style of living of their college mates--on the other the pressure for a formal wedding in a church they have never attended. Thinking that Quakers have no formalities--and no minister--Serenity turns fo This is the story of Peter and Serenity, two young people confronted with the problem of making a true marriage in the midst of today's confusions. On one side is the modern style of living of their college mates--on the other the pressure for a formal wedding in a church they have never attended. Thinking that Quakers have no formalities--and no minister--Serenity turns for help to her older cousin Oliver Otis, in Kendal. Quakers have a way of going to the heart of things, and at Kendal Serenity and Peter have a chance to work out the true meaning of their relationship. They find help in unexpected ways from the wisdom and shining example of Oliver and his painter-wife Daphne and from the other families and younger Friends of the community. This makes a moving and deeply felt story that appeals to young and old. The third of Daisy Newman's "Kendal novels," I Take Thee, Serenity is not a sequel to Diligence in Love or The Autumn's Brightness. However, readers who enjoyed the characters inhabiting the small New England town of Kendal will be glad to meet them again, including some of their grown-up children. To ask other readers questions about I Take Thee, Serenity, please sign up. Sometimes, when the timing is right, when your heart or mind are in a certain place and are prepared in just a particular way, specific books can be doorways. Doorways through which you walk and where new truth opens up and what is revealed is so profound it changes something inside you. That was my experience with I Take Thee, Serenity. Not that the characters or occurrences in the story were similar to my own life or experience, but more that the searching for answers and being led to them, often in surprising ways, is something completely familiar and that resonates with me. Perhaps for some readers the slang of the seventies might be off-putting, or the unfamiliarity of the Quaker lifestyle seem strange. For me, this was not a perfectly written book but it was certainly a heartfelt one read at the perfect moment. A gentle, beautiful book. 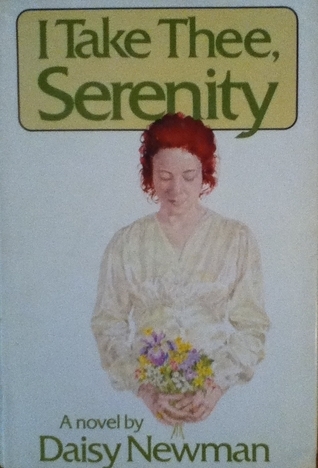 believe it or not I found this book in the early 80's and fell in love with the story, even red the 2nd book by the author, I liked the name so much I decided to name my first baby, serenity, it took some doing to convince family this is what I wanted, and on the day she was born, her dad actually liked it so well he named her, and came back to my room after I had her to tell me she was here! Read this story as a teen and it inspired my life-long interest in Quakers. I am now a supporter of the American Friends Society and consider myself a nontheistic friend. Serenity encompassed my being. I felt at peace as if I were at Fairbank. I also wanted to learn more about the Quaker religion. This was a nice way to start the New Year. This is a delightful book, and I love it unreservedly. I'm not sure anyone besides me would love it. It is very much a novel about the 70s, and commenting on society then. I don't even know if would make sense to anyone who is not already Quaker, for all that its central story is about a young woman discovering Quakerism and realizing that she and her fiancé are feeling led to be married under the care of a meeting. But I love it on its own merits. The characters are complex, everybody develops o This is a delightful book, and I love it unreservedly. But I love it on its own merits. The characters are complex, everybody develops over time, and it's a lovely coming of age story set among a community that sounds absolutely heavenly to be a part of. At first I struggled with this book, and thought that Newman was not a good writer. But the deeper in the book I got, the less I noticed her particular style, and I absolutely fell for this story. In fact I keep picking it up and re-reading parts. The book is a novel, but a novel about a couple discovering Quakers, and so she describes meeting for Worship, business meeting, a Quaker wedding, how Quakers deal with death, how Quakers live, plain speech - it's is all shown. It is all a bit shiny an At first I struggled with this book, and thought that Newman was not a good writer. But the deeper in the book I got, the less I noticed her particular style, and I absolutely fell for this story. In fact I keep picking it up and re-reading parts. The book is a novel, but a novel about a couple discovering Quakers, and so she describes meeting for Worship, business meeting, a Quaker wedding, how Quakers deal with death, how Quakers live, plain speech - it's is all shown. I finally got this book on an interlibrary loan from Carthage Public Library. I am excited about finding out how the different characters came to be in it's sequel "Indian Summer of the Heart." It was great to find out more about Serenity and Peter. It wass an enjoyable book to read, there is a feeling of peace and yes, serenity, in it as well as in "Indian Summer of the Heart." I found this story in a Reader's Digest condensed book as well as the sequel Indian Summer of the Heart when my children were very young. I became interested in the Quaker way of life and found both stories beautiful. Warm and comforting, this book provides a look at Quaker traditions and lifestyles and follows a young woman's growth toward self-discovery. A good read for anyone looking for spiritual growth or development. Charming if improbable story about a couple who decide to marry very young, and become part of a Quaker community in Rhode Island. Although dated, it is a fascinating introduction to the Quaker religion and lifestyle. Mrs. Newman was the housemother in my mother's college dorm. RDC-M V 1 1976, 6/78. A novel about a young couple, college life, marriage, and their Quaker religion. Okay. This is a Quaker story of two college students who want to marry. Very good. Eh. I'm pretty sure I would have hated this book had I not been fascinated with Quakers when I read it. Daisy Newman, a novelist and Quaker historian, was born in Southport, England, of American parents. She attended Radcliffe College, Barnard College and Oxford University. An active member of the Friends Meeting in Cambridge, Mass., she frequently wrote about Quaker life and history. She was the author of many novels, including "Now That April's Here," "Diligence in Love," "The Autumn's Brightness" Daisy Newman, a novelist and Quaker historian, was born in Southport, England, of American parents. She attended Radcliffe College, Barnard College and Oxford University. An active member of the Friends Meeting in Cambridge, Mass., she frequently wrote about Quaker life and history. She was the author of many novels, including "Now That April's Here," "Diligence in Love," "The Autumn's Brightness" and "I Take Thee, Serenity." She also wrote a history of American Quakers, "A Procession of Friends." She died in 1994.